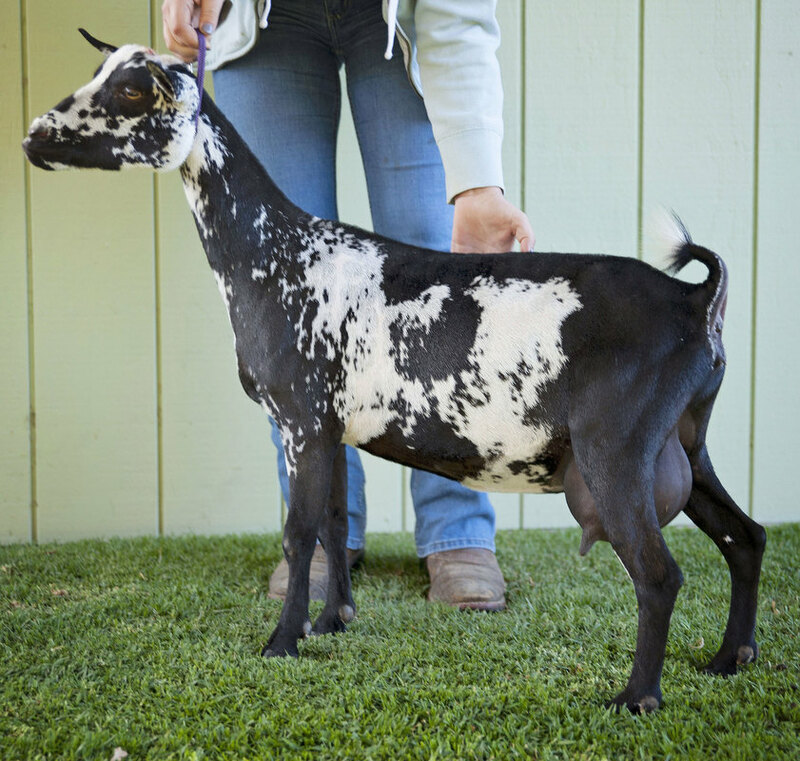 When making selections for which does to add to be a part of our foundation herd, a daughter of GCH CRF Castle Rock Tuscan Sun was an easy choice. We were pleased to have our reservation filled and bring this polled little beauty home with us. Dezi is still young, but in the time we have had her she has really come into her own. She continues to impress us day by day with her length of body, long feminine neck, and overall dairy character. Dezi stands on strong legs with a correct front end assembly complete with lovely brisket extension. This little doe is already doing her pedigree justice and we see a promising future ahead of her. Dezi's dam Tuscan Sun is a very correct doe earning a V & E in every category on her 2015 Linear Appraisal with a final score of VEEE 90 at 7 years old. She excels in general appearance and really is just breathtaking to look at. One of the best things about Tuscan Sun is her proven ability to pass her quality to her offspring as she has already produced three champion offspring. We hope Dezi will follow her dam's lead and be just as successful! It will be official! With Dezi producing 21 pounds of Butter Fat she will be earning her Milk Start as a First Freshener! Her Grand Sire, Castle Rock Cleveland Sage at just 5 years old already has 5 Superior Genetics, and 8 Grand Champion daughters on the ground and a good number that are well on there way to joining this list. Her Grand Sire, Castle Rock Cleveland Sage is a paternal half brother to the 2015 National Show Champion - GCH Castle Rock Flash Flood VEEE 90! She did a fantastic job delivering quints! Mostly unassisted, had to help untangle a few. Dezi easily earned her milk star as a first freshener in fat and protein. We will keep her in milk in her second lactation so she can earn her Star in volume as well. *2018 Milk Test will begin in March, we will update these records monthly to reflect the most current data. 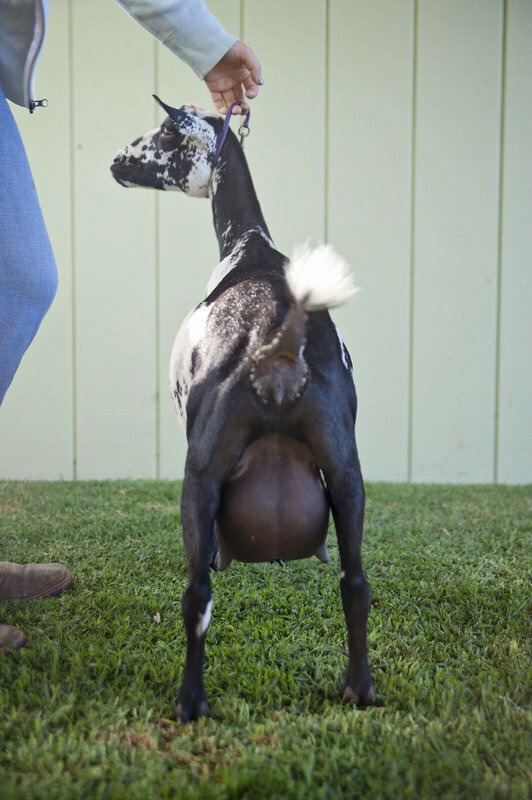 Moon River is a very dairy doe who excels in Mammary. She has very nice Fore Udder Attachment, Rear Udder Height and medial, all these qualities will help that udder stay functional for many years. Moonrakers Sire, Castle Rock Cleveland Sage probably needs very little introduction if you are familiar with these lines at all! 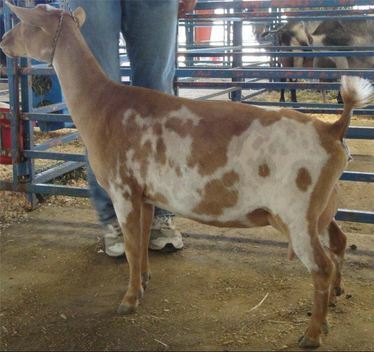 He has 10 registered 2012 daughters and already three of them have earned their SGCH Titles. We have long admired Tuscan Sun, she is a very dairy doe that has the body style and udder we would like to see more of here at Hidden Hills. Tuscan Sun has an udder that is very high and wide with a beautifully blended fore udder. She stands uphill on very correct legs and feet, with excellent rump structure (V in rump). Tuscan Sun has five daughters that have freshened, 3 of whom have LA'd at 90 or 91. The other two daughters have yet to be appraised. She also has several sons in various herds turning out amazing kids themselves. I don't think it gets any more consistent than that!